The Theorie SAGA Classic Titanium Flat Iron is inspired by professional stylists and it enables users to create intricate hairstyles easily and quickly. But before we go on to discuss the key features of this product, let’s first try to understand what a titanium flat iron is. 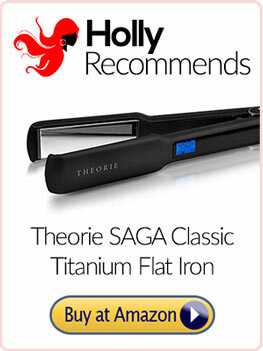 Treat Yourself to the Theorie SAGA Classic Titanium Flat Iron – Available Now on Amazon! Why Choose a Titanium Flat Iron? Today, you will mostly find flat irons that are either coated with ceramic or titanium. Ceramic has been around for quite some time now but titanium is relatively new. Both materials are very effective in styling the hair in the way you want however they also have some key differences. Titanium flat irons can transfer heat faster than ceramic so you get fast and great results. Ceramic on the other hand may not be as quick as titanium but it does protect the hair because it distributes heat evenly. In addition, it’s mostly used by salons because it’s very durable and can withstand heavy usage. Ceramic is mostly for home use. These are some of the reasons why a lot of women love the Theorie Saga Classic Titanium flat iron. It does an excellent job of straightening even the thickest and most stubborn curly hair and you don’t have to worry that the hair will get damaged or that the product will stop working after a short while. The Negative Ion Technology that is built into this flat iron can make the hair smooth and straight really fast. In just a few seconds, the optimum temperature will already be achieved and locked-in so the heat stays consistent throughout your use. It also prevents hair damage because of its Infrared properties which eliminate frizz and static when you use this tool on your hair. You get shiny beautiful straight hair that lasts. You can adjust the temperature to suit your needs. It doesn’t cause static when you iron your hair. It works just as well as expensive hair straighteners. You’ll see the temperature of the flat iron on the LED display. It comes with an auto shut off feature so there’s no need to worry if you left for work without turning it off. Using it is easy because of its ergonomic, non-slip handle. I can’t think of any drawback to the product itself. 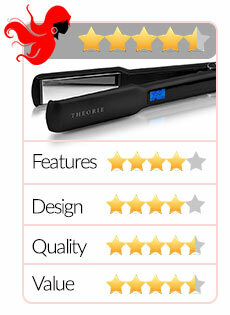 This Theorie straightener has garnered great ratings on Amazon, with majority of reviewers giving it a full 5 stars. Many have reported that they absolutely love this product because it works for them even if they have thick and coarse hair. The customers themselves have purchased several flat irons in the past, some twice as expensive as the Theorie SAGA classic titanium but they got better results with the latter. Some have also reported that they bought this product because it was recommended by their stylist or they saw it being used in salons. Finding the perfect hair straightener is not always easy. You have to go through several different products and brands to find one that suits you. There are hundreds of options you can choose from on Amazon alone, and there are a whole lot more when you browse the Internet. But the key to finding a good product is to choose a brand that is reputable. Buy a flat iron from a brand that has been known for creating high quality, effective tools especially when it comes to the hair styling industry. 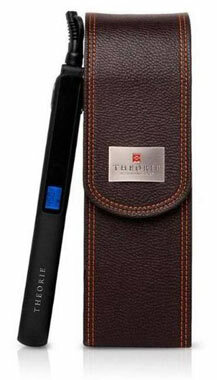 And this is where the Theorie SAGA Classic Titanium Flat Iron stands out. Sure, there are other cheaper flat irons out there – some going for as low as $20. But the question is, how much are you willing to invest on a high quality product that will not only give you beautiful straight hair but will also prevent it from getting damaged? If you value your hair’s health, then you won’t settle for cheap flat irons. 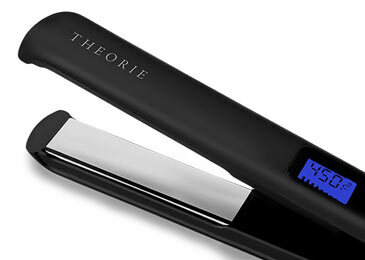 Having said that, if you’re willing to spend close to a hundred dollars for a flat iron, get this Theorie SAGA straightener.